The equipment now unpacked, the first sounds of balls on bats and in gloves were heard Tuesday in Sahlen Field as the countdown to opening day hit full speed ahead. But before the Buffalo Bisons' season has even started, upheaval in Toronto has made a major dent in the Herd's roster. First baseman Rowdy Tellez, who was still at spring training in Florida awaiting the trip to Buffalo, instead got the call to go to Toronto when the Jays moved designated hitter Kendrys Morales to Oakland last week the day before their opener. 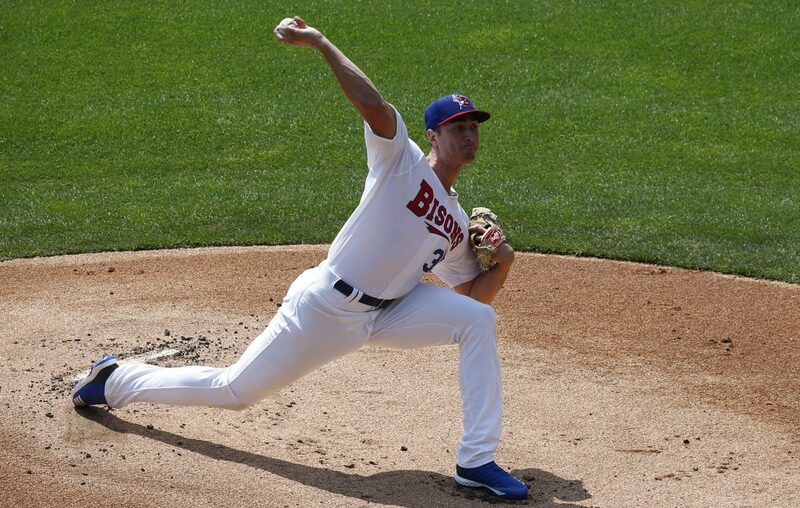 Pitcher Sean Reid-Foley, expected to be a mainstay in the Buffalo rotation, got the call Monday and started for the Blue Jays against the Baltimore Orioles after newly acquired starter Clayton Richard landed on the injured list. There was another big hit Tuesday as Anthony Alford, who played 105 games for the Herd last year and was again expected to man center field, got the call to Toronto after the Blue Jays traded fan favorite Kevin Pillar to San Francisco. Managing at Triple-A is sure going to be a different challenge for third-year skipper Bobby Meacham when the parent club is in a rebuild, as opposed to trying to contend like it wanted to for much of the last two years. "It doesn't change my attitude at all," Meacham insisted prior to his team's first workout in Buffalo. "I've got a group of guys I have to prepare to play these games and also at the same time I keep in the back of my mind I'm preparing them to play in the big leagues. You have to focus on those two things: What's best for us and what's best for them." Even without Tellez and Alford, the Bisons aren't fretting as they try to break their International League-high playoff drought that stretches to 2005. Mega Toronto prospects Bo Bichette and Cavan Biggio are set to play shortstop and second base, respectively, and lead a lineup that should see Vladimir Guerrero Jr. added to its middle in a couple of weeks when he completes injury rehab in Florida. Guerrero, of course, is only considered the top prospect in the entire minor leagues. "We have a great locker room in there with a lot of talented guys. People are going to want to see us play," said pitcher Jacob Waguespack, who will be the starter at 2:05 p.m. Thursday against Scranton/Wilkes-Barre. "I think it will be a lot of fun to watch all of us this year, develop and get ready to go to the big leagues." The trade of Pillar leaves only Marcus Stroman, Aaron Sanchez and Justin Smoak as key remaining pieces from the Jays' 2015 and 2016 playoff teams. Pillar was the Bisons' 2014 MVP after batting .323 with 10 homers, an IL-leading 39 doubles, 59 RBIs and a 21-game hitting streak. He graduated to Toronto and became known as "Superman" for his spectacular leaping catches on the warning track and against the wall in center field at Rogers Centre. The Blue Jays acquired three pieces for Pillar, with reliever Derek Law coming to Buffalo. Law, 27, pitched 109 games in relief for the San Francisco Giants the last three years. Waguespack, 25, is a 6-foot-6-inch right-hander the Jays acquired from Philadelphia at the trade deadline last July. He was in Buffalo playing for Lehigh Valley and simply walked across the diamond into his new dugout. Two days later, he set a Bisons modern-era record for a pitcher in his debut by striking out 12 of his former teammates. He finished 2-for-4 with a 5.03 earned-run average in seven outings for the Herd. "I had a lot of fun. I know all those guys in the other dugout. They knew me as well," Waguespack recalled. "They were hollering at me, poking fun while I was on the mound. I was loose and relaxed and it was one of those days where you enjoyed being at the ballpark." Waguespack said he never got an Opening Day start in college at Ole Miss or anywhere in the pros. "There are guys who could have been on our team were it not for the injuries and anyone could have had it," he said. "But I'm definitely excited and ready to roll. You want to set a tone and I'm excited and ready to do that. We've got a good team and we'll be ready to go." Meacham said it was interesting to see the meshing of the big-league coaching staff under new manager Charlie Montoyo during spring training. He said he got a call Tuesday afternoon from new field coordinator Shelley Duncan, the former Yankees and Indians outfielder, and heard from Montoyo on Monday. "They're interested in what's going on down here and they're having fun up there in the meantime," Meacham said. "Charlie's intent on keeping contact with me a lot but we've got a few coaches up there to keep in contact with. John Schneider (who managed Double-A New Hampshire to the Eastern League title last season) is up there and I'll be talking to him a lot. We're all being contacted and keeping tabs on each other. We're keeping tabs, seeing what they need and they're looking down seeing what they can use." Mike Harrington – Mike Harrington has covered the Sabres, MLB, the Bisons, college basketball and high schools since joining The News in 1987. He is a National Baseball Hall of Fame voter, a 2013 inductee into the Buffalo Baseball Hall of Fame and the chairman of the Buffalo chapter of the Professional Hockey Writers Association.